Craig Elliott is an illustrator, visual development artist and layout artist who works in the film industry. He has worked on numerous films for Disney Feature Animation, Dreamworks and other studios. His credits include titles like Bee Movie, Shark Tale, Flushed Away, Mulan, The Emporor’s New Groove and Treasure Planet. 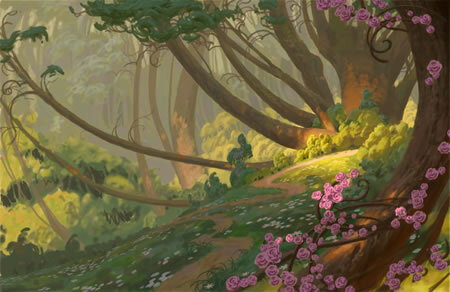 He has also done work for the new Disney Feature Film Enchanted (image above). In his online portfolio you’ll find a a variety of images of location design, creature and character design, color keys, 3-D models and sets, as well as fantasy illustration. A number of the most interesting and imaginative images are from Disney’s animated feature Treasure Planet, for which Elliott’s contributions were extensive. He is featured prominently in Treasure Planet: A Voyage of Discovery (more info here), a collection of art done for the movie that also includes artists like Peter Clarke, Peter De Seve, Ian Gooding and Christophe Vacher. Some of my favorite pieces in Elliott’s portfolio are black and white location design images for Treasure Planet that have a wonderfully imaginative, otherworldly quality, rendered with grainy textures and atmospheric tones. Objects that might be plants, rock formations, or both, extend into the sky over oddly surfaced plains, or form gigantic rippled walls against which tiny figures are silhouetted. Wonderful stuff. Note: The site contains some NSFW material. That really was interesting! I thought the picture looked familiar! no wonder it looked so familiar! wow, thanks for this piece of art. IT IS WONDERFUL! You are the Best!!! Thanks for the shout out! I love your site, and especially how you include older artists and illustrators . Many folks ignore these people and they often have the most to teach us. For the benefit of other readers, I’ll point out the Craig Elliott’s site has been redesigned, features a new gallery arrangement and now includes a blog. stunning beautiful work, I love it!! I think Craig and I will be sitting at the same mega booth for Spectrum Live in May. Thanks for posting this Charley. Love his work. Sounds like the booth to check out! Thanks, Bill.